Looking for a way to liven up your Moscow weekends? A good way to discover Russian culture – русская культура (russkaya kul‘ tura), it is to visit one of the many museums – музеи (muzei) in Moscow. Should we mention the classics? 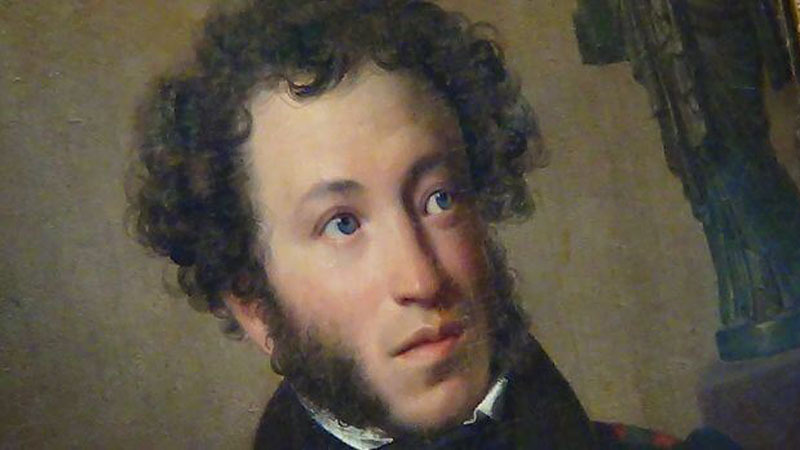 The Pushkin Museum – Музей имени Пушкина (muzei imeni Pushkina) with its collection of European art, the Tretyakov Gallery, or “Tretyakovka” for short, and its exceptional collection of Russian paintings from Russia’s historical beginnings, and finally, the Kremlin Armory – Оружейная Палата (Oruzheynaya palata) forms a trinity of Moscow museums that cannot be missed. Additionally, you are spoiled for choice, from the Museum of the East – Музей Востока (muzey Vastoka), to the smaller museum of the Moscow Metro – Музей Московского Метрополитена (muzey maskovskava metrapalitena). You are sure to find something to brighten your leisure hours – досуг (dassug). Even with a basic Russian vocabulary, you are sure to have a wonderful time. Double-check the holiday- выходной день (vykhdnoy den’) schedule when the museums are closed, and the regular hours when the museums are open – часы работы (chasy raboty) before you get there. As always, to make it easier when traveling around Moscow, grab a “how to get there” map – схема проезда (skhema prayezda). The price of admission – цена входного билета (tsena vkhadnova bileta) to Moscow museums may differ depending on whether you are a foreign citizen – иностранный гражданин (inastrannyy grazhdanin) or a Russian – русский (russkiy). If you have a residence permit – вид на жительство (vid na zhitel’stvo), you can sometimes benefit from the more advantageous – более выгодный (boleye vygadny) “Russian” price. Although foreigners in Moscow may consider this an unusual practice, it is quite common in many countries worldwide, including Europe, where it is considered that if their citizens are already paying taxes, making them pay the full price of a museum entrance is a double punishment. All museums have a staffed coat room – гардероб (garderob), and some museums require you to check coats, jackets, and overcoats, grouped under the generic name of outer-wear – верхняя одежда (verkhnyaya adezhda), bags, backpacks – рюкзак (ryukzak), and even handbags – дамская сумка (damskaya sumka). It is required – обязательно (abyazatel’no), and non-negotiable – не обсуждается (ne absuzhdayetsya). 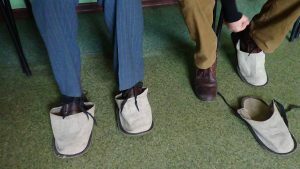 If you visit the house of a famous writer – дом писателя (dom pisatelya) or a former mansion or a specific historically-important hotel – (assabnyak), you will be asked to put on “overshoes ” – тапки (tapki – see picture), or plastic, disposable “booties” – бахилы (bakhily). To feel like we are in our own homes – чтобы чувствовать себя как дома (chtoby chuvstvovat’ sebya kak doma). Not to disturb history with our footprints – чтобы мы свой след в истории не оставляли (chtoby my svoy sled v istorii ne astavlyali). Not to wake the sleeping museum guards – чтобы спящих сотрудников музея не будить – (chtoby spyashchikh satrudnikov ne budit’). You are now ready to enjoy the exhibits – экспонаты (ekspanaty) at your own pace and discover the wealth of collections – фонды (fondy). If your level of knowledge of the Russian language allows it, do not hesitate to ask questions – спрашивать (sprashivat’) of the women who monitor each room – комната (komnata), because they are generally very well informed – осведомлены (asveddamlieny) and sometimes they have read – прочитали (prachitali) almost everything that could be read on the subject -о теме (a teme) you are interested in. Most of the time, near the exit – выход (vykhod), you will find a small souvenir shop – магазин сувениров (magazin suvenirov) or kiosk – книжная лавка (knizhnaya lavka) selling books often not found anywhere else. For example, at the library known as the Lenin National Library – Библиотека имени Ленина (Biblioteka imeni Lenina) (of which the small museum is a must-visitplace for lovers of the written Russian language) there is a book containing written accounts of the memories – мемуары (memuary) of Gulag survivors that were collected by an old survivor of the camps. If you come on the right day, the daughter of the author – дочь автора (doch’avtora) of this collection – сборник (sbornik) herself will sell it to you! Larger museums also have a cafeteria – кафетерий (kafeteriy) so you can have a little snack after your visit. Remember first, though, of course, to throw away – бросить (brosit’) your used – использованные (ispol‘zovannyye) shoe covers!